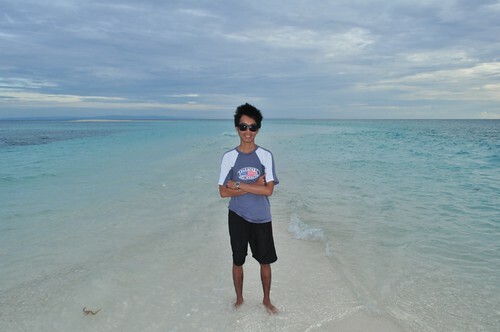 Camiguin, Come again! 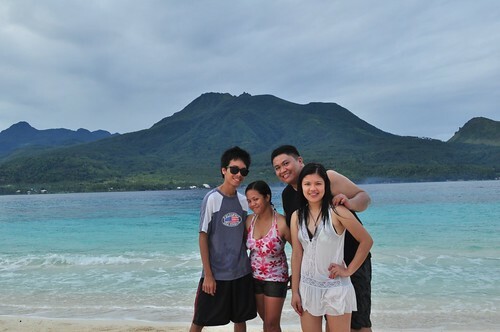 Before we had ended our last day of our Camiguin trip, we went to White Beach Island. We woke up at 4:30 AM and had breakfast. It was a good thing that we stayed at Paguia’s Cottage since it only took us 10 minutes to go to the white beach island. The boat ride cost PHP 400.00 back and forth. The sun is still set to rise when we got there. It was cloudy and the weather is fair. By the way, we paid PHP 20.00 for the island fee (maintenance of the island). We dropped our things on the sand and roamed the island. It was just a small island. All sands. The island is visible during daytime. Usually appears during low tide. We love the island but the beach is not that spectacular, medyo makati ung tubig – may kumakagat. We intended to stay here for only an hour because we need to catch the ferry back to the Balingoan Port at 9:00 AM. The sun is up by the time we left the island. As soon as we arrived at our cottage, we fixed our things and took a shower. By 8:00 AM, we left Paguia’s cottage then off to Benoni Port. We arrived at the port just in time for the scheduled ferry, however it was delayed. There are lots of passengers waiting at the port, and the next ferry will still be at 10:00 AM. We panicked a bit. If we can’t get to Cagayan De Oro by 02:00 PM, Aphol and Win might be left by the plane going to Cebu. Anyways, we can’t see any other option but to wait for the next ferry. When the ferry arrived, we boarded immediately to have a good seat. I slept during the entire trip. I needed to catch some sleep because I still have shift later tonight. At 12:00 PM, we arrived at the Balingoan Port, we immediately looked for a van going to Cagayan De Oro city. According to locals, the van travel faster than the bus. The vans were almost full which can’t accommodate 5 people anymore. Then we found one across the street. I was not happy that we rode in a van. We’re all crammed. The humid is bad, it’s hot inside even if the aircon was on. I wasn’t not comfortable with my seat. After 2 hours… thank God, we arrived at the Cagayan De Oro City. It was already past 2:00 PM, Aphol and Win still have 3:00 PM flight to catch, so we asked the van driver to take us to the airport. At 2:45 PM, we arrived at the airport. Unfortunately, Aphol and Win were unable to board. They went to ticket outlets if there are cheap flights going to Cebu but there was none. The only option we had was for Win take a ship going to Cebu and for Aphol to come with us by using our extra plane ticket. Aphol is from Manila, she’s living in Cebu back then when we booked our flights. We took our late lunch and made some plans. At 4:00 PM, we decided to check in. 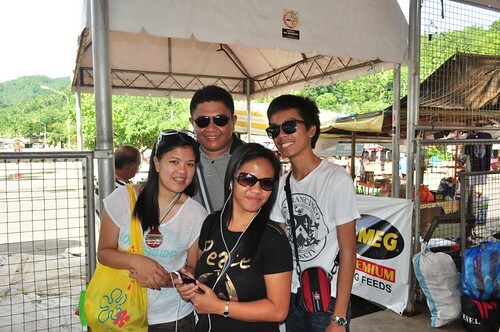 So Win went to the port going to Cebu then we headed to the airport. As we walked along going to the airport entrance, we bought some extra pastel for take home and Majoy bought a vinegar. Afterwards, we already went to the airport. We placed our pieces of baggage at the scanning section, and the lady asked Majoy if she had a liquid inside her bag, so she said there was. Then the lady told Majoy that it wasn’t allowed to have it hand carry and Majoy have to check it in. So she panicked a bit, and Marlon told her to wrap it with lots of her used clothes so it can’t be seen, so she did. I laughed and teased Majoy because of her Vinegar incident. Moving on, me and Aphol went to the check in counter, and we’re now ready to board. But wait, the Cebu Pacific officers came to us and asked us to have our pieces of baggage weighed first since we only availed Go Lite. We panicked again since we have lots of baggages, dahil kasi sa Pastel na yan. But it all turned out good, it was only Marlon who exceeded on the allowable hand-carry. We moved on. At 5:00 PM, the plane departed Lumba Airport. We arrived Manila at 6:20 PM. Back to reality! It was a fun-filled and adventurous trip to Cagayan De Oro and Camiguin. I’m looking forward for more trips to Mindanao like Zamboanga, Davao and Bukidnon. Until our next trip. Paguia’s Cottages and Paras Beach Resort are just 10 minutes away from the White Beach Island. 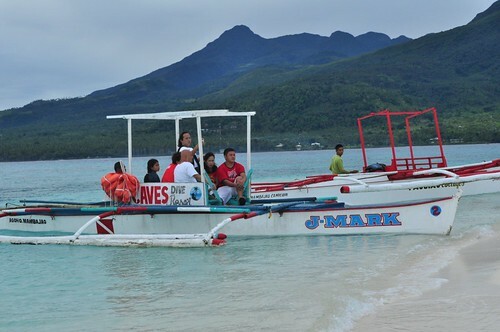 Boat going to the White Beach Island cost PHP 400.00 back and forth. Know trip schedules of bus and ferry. To avoid delays, have an hour buffer for ferry/bus trips. Bus is more comfortable than public van. It is more spacious. Enjoy the trip and have fun! rafting which is the most visited place for tourist. Yan yung sikat na White Island… ganda. Mas marami mapupuntahan sa Camiguin kesa sa CDO right? Kasi aside from White Water rafting, wala ng ibang mapupuntan or magagawa dun? Mental Climax > Thanks for the comment. Yup saya nga!